It's hard to be truly productive when your productivity suite isn't optimized to your work style. Here are several tweaks for Microsoft Office that you can do in just a few minutes. 30 seconds If you don't want "..." to become an ellipsis or "---" to turn into a page-wide horizontal line, or if you dislike any other automatic "corrections" that Microsoft Office performs by default, follow these steps. Type the word or character sequence you want to change--and stop typing immediately once the AutoCorrection has taken place. You will see a small icon with a lightning bolt appear on the screen, next to the correction. Click the box and select the second option in the menu. That option's text changes depending on the specific correction; for example, it will read ‘Stop Automatically Creating Bulleted Lists' when you type a > symbol. Selecting this menu item once will terminate the autocorrection behavior permanently. For more-detailed AutoCorrect settings, or to remove specific words from Office's list of automatic typo fixes (if, for example, your last name is "Wrod"), click the Office button and go to Word Options, Proofing, AutoCorrect Options. You should also look under the ‘AutoFormat As You Type' tab for additional settings. 3 minutes If you're a longtime Office user who hasn't warmed up to the Ribbon menu layout in the newer versions of the suite, you can regain the classic look with a simple download. Several add-ons can give you the old menus back, but UBitMenu is free for personal use. 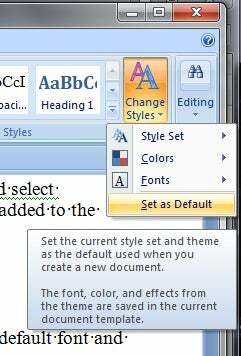 2 minutes Your first step is to create a block of text using the style that you wish to appear as "Normal"--the default font and paragraph style that Word will use whenever you create a new document. Once you've adjusted the font and styling, set them as the default. Make sure to set not just the text's font and size, but also the paragraph styling: Select something within the block of text that you just created, right-click it, and then choose Paragraph. Set the line spacing, indentation, and alignment. Next, select some of the finished text, right-click it, and select Styles. Click Update Normal to Match Selection. 3 seconds As you type in a message's ‘To:' field, is Outlook automatically suggesting something by filling in an e-mail address that is incorrect or otherwise no longer useful? You can get rid of it simply by scrolling down the suggested list and pressing the Delete key.